Pi Lambda Phi is back. The fraternity, which lost its Temple recognition in 2004 and its national recognition in 2006, has officially recolonized on Temple’s campus, and its members hope for full organizational status by the end of the academic year. Members and organizers said they’re making the most of their second chance. The Alpha Delta chapter of Pi Lambda Phi lost its university recognition in 2004 due to multiple offenses, including providing alcohol to minors, failure to comply with Pennsylvania state law and failure to adhere to local fire and health codes. At that point, members of the international headquarters were notified and attempted to resolve these issues by working with members of Temple’s chapter. However, Lowe said, the members at the time weren’t interested in changing their ways. While five years might not have been the time they planned for, with the help of Lowe and Expansion Coordinator Phillip Spence, the fraternity is coming back to Main Campus. Lowe will be living in an off-campus apartment for the duration of the school year to help the organization. Those values – academics, leadership and service to community – are what brought in two of Pi Lambda Phi’s newest members, Andrew Bollinger and Nate Moore, the pair said. Moore, a sophomore chemistry major, said he had never considered Greek life before but sat down with Lowe and Spence and was immediately interested in joining the organization. Bollinger, a junior political science major, said after reaching out to Pi Lambda Phi through the organization’s Web site, he was contacted almost instantly by Lowe. Bollinger said since joining the organization last month, he has been able to not only help develop Pi Lambda Phi, but develop his own confidence and personal skills as well. Both Moore and Bollinger said they have high hopes for the organization but understand it might take time. 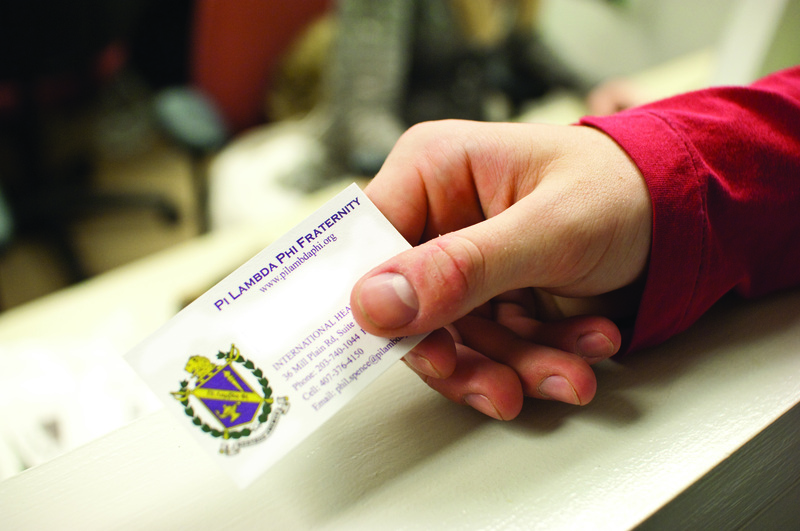 Pi Lambda Phi’s members are working hard to regain a positive image with university administration, other students and the community. Bollinger said the fraternity is looking forward to working with all types of Greek and non-Greek organizations, and Lowe said they have already begun putting a Pi Lambda Phi alumni advisory board in place to help the fraternity stay on track after he and Spence are gone. Lowe added that certain study hours and other requirements will be put in place so the fraternity has a greater chance of succeeding. Christopher Carey, advisor to Temple’s Interfraternity Council, explained that they will also be implementing programs to help Pi Lambda Phi and other fraternities do well. Lowe said it should just be a matter of some procedural paperwork before Pi Lambda Phi is able to petition the IFC for full recognition. But for now, he said they have already been welcomed back and will relish their second chance. APO is a co-ed fraternity that aims to serve the community.